to Duncan's SuDoku Solver webpage. 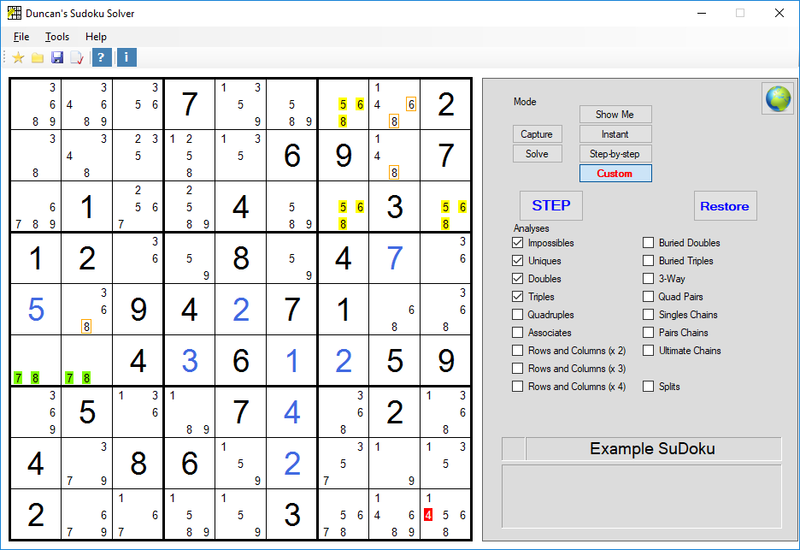 Here you can download the latest version of the Solver as well as get your fix of the latest SuDoku puzzles. I've tried to make the Solver useful and fun for all levels of ability - from the "average" newspaper Sudoku all the way up to the toughest SuDokus you might find on the net. So even if you are not interested in "Buried Triples", "Naked Quads", "X-Wings", "Jelly Fish" and the like, but just want a convenient way to solve your daily newspaper SuDoku puzzle without lots of scribbling and rubbing out - then this is the Solver for you. Equally, if you DO want to analyse the most difficult SuDokus out there, then this Solver has all the Analyses to do it AND will present the information in the clearest and most easily understood way. Combining these two approaches, of course, provides a great tool for bringing the casual user up to expert level. The basic SuDoku Solver is free to download, but I do ask you to enter your email address to "register". SuDoku MegaBooks are now available. The Solver also handles Killer SuDokus. Solve the SuDoku yourself, entering solutions (big numbers) and possible solutions (small numbers).